This article was originally written by Mai Thanh Tu for the Humidtropics blog. Reposted here with permission. Northwest Vietnam is a mountainous area bordering China to the north and Lao PDR to the south. About 30 ethnic minorities with distinct languages and traditions, including cultivation practices live in the area, the most populous groups being Thai, H’mong and Nung. It is estimated that roughly 80 percent of the population’s livelihoods are based on agriculture. The area is also poor: poverty rates of Son La and Dien Bien are 29.4 percent and 38.6 percent, respectively, compared to the national average at 9.8 percent, according to statistics from Vietnam’s General Statistics Office. In the four provinces of northwest Vietnam (Son La, Dien Bien, Lai Chau and Lao Cai), 17 districts are included in the list of 61 extreme poor districts under the government’s support program for sustainable poverty reduction. Ethnic minorities are usually among the poorer and less educated groups in Vietnam. Driving a multi-partner initiative to transform the lives of the rural poor, Humidtropics launched a new research for development (R4D) platform in Son La, northwest Vietnam, on March 13, 2015. This is the fourth R4D platform launched in the Humidtropics Central Mekong Action Area, and second in Vietnam, after Central Highlands. The other two are ‘Together Making Nan Better‘ in Northwest Thailand, and ‘Xishuangbanna Alliance for Rural Sustainability‘ in Xishuangbanna, China. These R4D Platforms show Humidtropics and its implementing partners’ commitment and efforts towards more need-driven research, which will lead to wider up-scaling and greater impacts of research results. 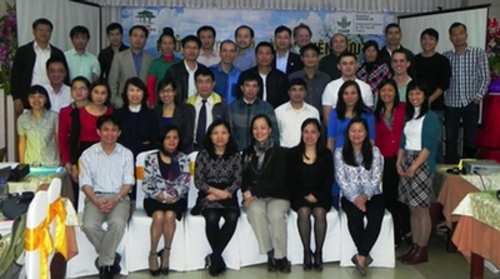 R4D platform launch meeting in Son La, northwest Vietnam. Photo credit: Thanh Tu Mai/ICRAF. More than 40 participants attended the launch organized by the World Agroforestry Centre (ICRAF), representing a wide range of organizations: international and national research institutes, governmental agencies (such as Department of Plant Protection, Department of Crop Production, Department of Agricultural Extension, and Department of Health) and mass organizations (Farmer Association, Women’s Union), as well as international and local NGOs. The R4D platform will help to consolidate different research activities in the region. It will serve as a space where researchers and other relevant actors can come together to exchange knowledge and experiences in order to prioritize research topics for the Northwest, and to share and to validate the research results. Farmer representatives are engaged in the Platform and the research process to ensure that research is more demand-oriented and to ensure farmers’ ownership of research results. This is also important to enable scaling-up research uptake. 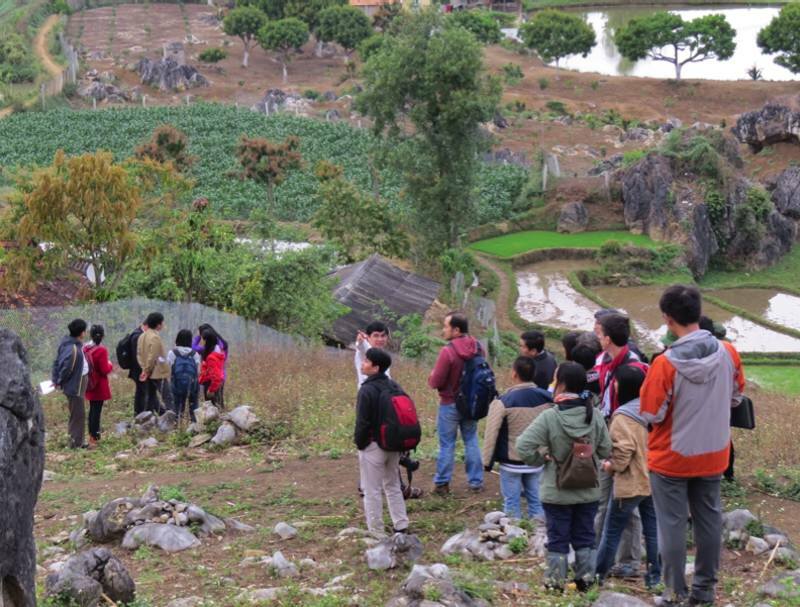 Results of the Humidtropics situational analysis for northwest Vietnam showed that mono-cultivation of annual food crops such as maize, rice and cassava on steep slopes are main reasons for soil erosion and degradation, resulting in low agricultural yield. Other issues indicated above that have emerged from the study are low productivity and soil degradation; special indigenous and high-value products; needs and opportunities for ethnic minorities; value chain development and improving dietary diversity. Humidtropics, in the context of stakeholder R4D platform, is hoping to develop sets of activities or interventions to test and demonstrate integrated solutions based on results of the situational analysis. Field visit to Doan Ket village, Muong Bon commune (Mai Son, Son La). Photo credit: Thanh Tu Mai/ICRAF. Multi-strata agroforestry system with teak-plum-coffee-maize and fodder grass and macadamia-coffee-short-term crop trials led by ICRAF. During the field trip, participants visited bare, steep hills where farmers cultivated annual crops such as cassava and maize, even up to the top where land fertility was very low. It is expected that sustainable integrated farming models would provide solutions for increasing farmers’ regular income through improving agricultural productivity while protecting the soil. Together with the demonstration and on-farm trials, various training sessions on farming techniques will be provided to both farmers and agriculture extension workers. An issue expressed by the farmers during the field trip was that they are struggling with market access, as most of the products produced in the region are consumed only in the households or in local markets, thus training farmers on marketing skills and support in establishment of market linkage is one of the key activities in the future. Group discussion to identify existing Humidtropics research gaps. Photo credit: Tran Phong. On the second day of the meeting, participants discussed Humidtropics’ integrated systems approach and R4D platforms. They identified several research topics relevant for Humidtropics research in the next phase, such as customer and market surveys for the northwest’s agricultural products, development and promotion of local products such as native black chicken and pig, as well as native vegetables and fruits. In order to have a well-functioning R4D platform, participants agreed that it was necessary to decide on the functioning mechanism and who should be the platform facilitator and core team members. In the next six months, research activities on a wide range of topics will continue to be carried out in northwest Vietnam: integrated farm trialing, off-season vegetable testing, home gardens and home-based production systems, water management, and nutrition. It was agreed that the next R4D meeting will be organized in September or October 2015, when researchers will present initial results of integrated system solutions for Northwest Vietnam to various related stakeholders who share the same interest in sustainable development for northwest Vietnam. 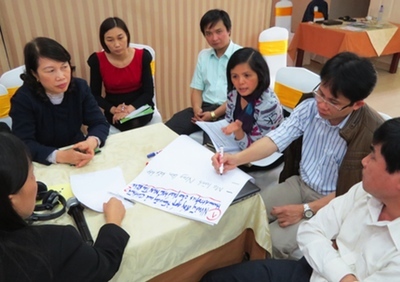 Blog by Thanh Tu Mai, Monitoring & Evaluation Officer, Humidtropics/ICRAF, edited by Lisa Hiwasaki, Central Mekong Flagship Manager, Humidtropics/ICRAF, and Hoang Thi Lua, ICRAF. Blog edited by Valérie Poiré, Communication Officer, Humidtropics. See a related article on northwest Vietnam. Tags: asia, Central Mekong region, crp12, HUMIDTROPICS, innovationplatforms, northwestvietnam, R4D, value chains, vietnam. Bookmark the permalink.